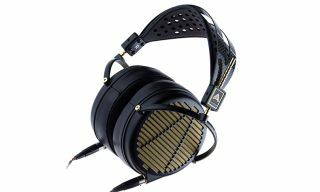 New Audeze LCD-4z are easy-to-drive high-end headphones | What Hi-Fi? The £3599 over-ear design goes on sale later this month. Audeze’s flagship LCD headphone series (which in our experience is the highlight of the US brand’s catalogue) has come a long way since the LCD-4 planar magnetic headphones first launched in 2015. The company has now introduced a ‘collectable’ version, and several LCD models to sit beneath it. Today, Audeze has announced its latest spin on the LCD-4: a lighter, easier-to-drive variant called LCD-4z. Audeze says the LCD-4zs share the same technology as the originals (which continue in the line-up) – including the 106mm planar magnetic driver - but are 25% lighter, thanks to a magnesium ring design. They also have a 15ohm impedance (compared to the LCD4’s 200ohm design), which should make them much easier for portable music players and smartphones to drive. The LCD-4z are equipped with 4-pin mini-XLR jacks and come with a 1/4in-to-dual 4-pin mini-XLR premium LCD headphone cable, as well as a travel case. Priced at £3599 (matching the LCD-4s), the new model will be available later this month.